We're located just 5kms (NE) from Margaret River township, in a delightful rural setting. Our upgraded cottages and studio, each of which provides superior levels of comfort, have private enclosures for well-behaved dogs. Our farm animals are fed each Saturday, Sunday, Tuesday and Thursday mornings, an activity which is much loved by children and adults alike. 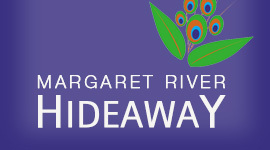 Margaret River Hideaway is a unique property which will suit honeymooners, couples, families and small groups. Located on 23.3 hectares of private parkland and pasture, Margaret River Hideaway has 2 Standard and 2 Superior X 2 bedroom cottages, 1 Standard and 2 Superior X 3 bedroom cottages and a 1 bedroom Studio. All are furnished to a high standard and are fully self-contained. Our Manager lives in the homestead (by the gate) and supervises animal feeding of our sheep, geese, chickens, peacocks, alpacas,guinea fowl, and Scottish Highland cattle. Our Manager is available throughout the day, either on site, or via mobile. Travelling south along Bussell Highway, pass through Cowaramup and travel 8.5kms to the junction with Osmington Road (watch for the large " Brewery" sign). Turn left and proceed 2.2kms and we're on the left. From Margaret River, travelling north along Bussell Highway, proceed 3.1kms to the junction with Osmington Road (watch for the large "Brewery" sign). Turn right and proceed 2.2kms and we're on the left. The deposit (or payment in full) is non-refundable unless the cancelled accommodaton is rebooked for the entire duration.